Fo Yo Soul Recordings/RCA, a joint venture between gospel music icon Kirk Franklin and RCA Records, received twelve Stellar Award Nominations in the label’s first year of operation, with multiple nominations for founder Kirk Franklin and the hit debuts by The Walls Group and Tasha Page-Lockhart. The Walls Group’s debut release FAST FORWARD, cracked the Billboard charts at No. 1 with their single “Love On The Radio” peaking on the Top 10 Gospel Radio charts. 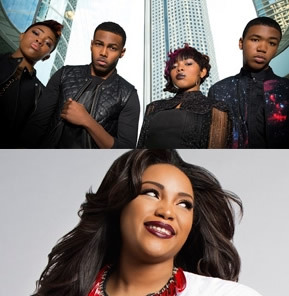 The project received several nominations across major categories for the 2015 Stellar Gospel Music Awards. Recorded Music Packaging Of The Year (Jeff Gilligan, Designer) Tasha Page-Lockhart’s rising star power is showcased on the “Sunday Best” winner’s debut release HERE RIGHT NOW, featuring the single “Different,” and receiving multiple major nominations. “Different” is currently number 7 on the Gospel Radio Charts and climbing. 15-time Stellar Award winner, Kirk Franklin dominates the Producer of the Year category, with two nominations. Franklin will introduce both acts during the highly anticipated “Fo Yo Soul” performance at the 30th Annual Stellar Gospel Music Awards ceremony on Saturday, March 28 in Las Vegas.